Sipsmith Distillery, Brackenbury Village, Hammersmith, West London, England, UK. Sam Galsworthy and Fairfax Hall grew up together as childhood friends in Cornwall, England and both pursued careers in the Drinks Industry, most recently for Fullers and Diageo respectively. 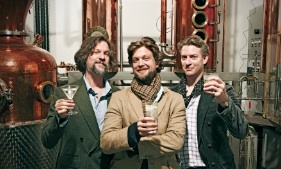 Returning back to the UK in 2006, having seen the craft spirit movement in the USA and developing a passion for handcrafted drinks, they established Sipsmith on 14th March 2009. This came after 2 years of administrative battling (as no one had sought a distillery license in London since Beefeater in 1820) and the selling of their homes to fund the “Gin project”. 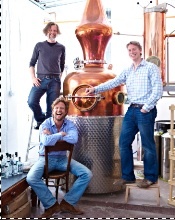 With the first copper pot distillery to open in London for nearly 200 years (189 to be precise), the company is ably supported by Master Distiller Jared Brown and Distilling Manager Chris Garden. Their mission is to create exceptional small batch artisan spirits and it is more than fair to say this is achieved with great aplomb. The distillery was founded on the site of an operational microbrewery from the 1700’s to the 1900’s, and more recently was the prior residence of the late and great beer and whisky writer Michael Jackson. 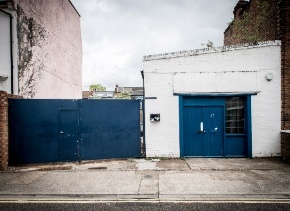 2014 expects to see them move to a new distillery venue in Chiswick, West London - where they also plan to add a third still to the production facilities. Tours and tastings are available on site, but check for times and dates and only by prior booking - especially important as these visits also sell out fast. Their Sloe Gin was first launched in the fall of 2010 (UK) and is expected to make its debut in the USA for 2014. Using methods and recipes dating back 300 years to the early 18th century the Gin is made from a 5 times distilled base spirit of English barley – a rare and certainly more expensive choice of grain and just like a malt whisky. 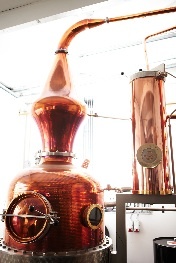 The botanicals are steeped in the warm base spirit for 12 to 15 hours after which it is distilled in a “one shot” method using one of two unique 300-liter copper pot stills called Prudence (installed March 2009) and Patience (installed April 2013). Each have been made by German company Christian Carl and possess both column and carter-head facilities. The spirit is made in small batches of up to 500 bottles (usually around 300 - 400 bottles) and hydrated with Lydwell Spring water from the Cotswolds, one of the sources of the River Thames (that flows through London). Each gallon of this Gin (at 70% ABV) is used to steep with a small amount of sugar and 4.5 lbs of hand picked sloeberries (from Dartmoor we believe) each fall. After several months it is diluted with water and left for a further few months. Once matured in spring, around 3 - 5 months later, a sugar solution (simple syrup) is added before this seasonal offering is bottled. Every bottle is individually numbered and the vintage (year) clearly stated, as there is some variation in the sloes from year to year. The intense deep red colored Gin is presented in a clear squat cylindrical bottle with rounded shoulders. 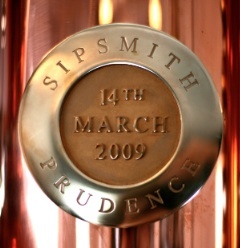 The mostly burgundy colored label has a square of copper foil in the middle, reflecting the use of a copper pot still. On the label are hand drawn images of juniper and their copper pot still, which transforms into the neck of a Swan (a play on the term “Swan’s-neck” to describe the turn at the top of the still where the vapor trail starts it’s journey of condensing). $$$$$$ - $$$$$$$. Not available in the USA but it is expected to be available during 2014. Until then try online from Master of Malt in the UK and prepare to add around 40% extra for shipping. Uses 11 botanicals including: almond powder (Spain), angelica root (Belgium or France), cassia bark (China), cinnamon bark (Madagascar), coriander seed (Bulgaria), juniper berries (Macedonia), lemon peel (Spain), liquorice root (Italy or Spain), bitter orange peel (Seville, Spain), orris root (Italy) and sloeberries (UK). Co-founder Fairfax Hall’s father is a silversmith and he suggested that an artisanal distiller was an equally specialist craftsman who is entitled to use the suffix of “smith” also. Just as you have blacksmiths, silversmiths and more recently wordsmiths and songsmiths the distillers realized they enjoyed all things “sippical” it was this background that pointed to the birth of “Sipsmith” - not to mention their initial location being in “Hammersmith”. The “Sloe” refers to the key botanical flavoring used. On the nose is a strong red fruit aroma (cherry, cranberry & redcurrant) with a hint of almond and faint green herbal and juniper qualities. On the palate this lightly sweet and velvety smooth spirit has dominating red fruit (blackcurrant, cherry, plum & rhubarb) tart puckering flavors with hints of spice including cinnamon and almond. On the close the sweet red fruit continues with developing dry crisp green juniper Gin notes with pepper in the long finish. A complex, flavorsome and relatively dry Sloe Gin. This is a good artisanal big Sloe Gin and is to be greatly lauded above many traditionally bulk produced examples. The dry Gin characteristics are evident creating a truer rendition of a quality homemade product – and this is very much to our liking (if you prefer sweeter Sloe Gins this may not be for you). Sipsmith’s Sloe Gin is a fine example to take neat (as a winter warmer) or paired with cheese, fruit and chocolate desserts but can be mixed with sparkling wine (e.g. Champagne), soda water, tonic water etc. to make a great summer time treat. Overall this is highly recommended and certainly hits our top 20 Sloe Gins.